My first review of the year and it’s a Kevin Hart movie. I know how that sounds like man Julian is starting the hate MAD early. See I like Kevin Hart, I laugh at Kevin Hart and I see most of his output even, that Real Husbands of Hollywood show on BET. I just find it interesting that we might be in a thing where mid-January is his time to shine in the theaters and get money. One more year after Ride Along last year and this movie The Wedding Ringer and proof will be in the pudding. The Wedding Ringer is another starring vehicle for Hart this timed teamed with Josh Gad aka Olaf the new GOAT snowman. Also in this movie is Kaley Cuoco and a personal fav of mine Olivia Thirlby. 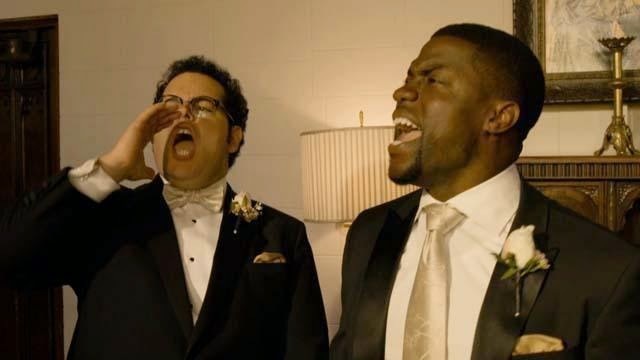 The Wedding Ringer is about Jimmy, played by Hart, a man that sells his services as a Best Man to people who don’t have one for their weddings. Josh Gad plays Doug, a man with no friends at all and is marrying his dream girl but has been lying about a made up best friend by the name of Bic Mitchum to her since they got engaged. Doug ends up being referred to Jimmy to help him in his problem and he hires Jimmy to be Bic and also get him groomsman and an entire history of friendship in two weeks before he weds Cuoco’s Gretchen. That’s essentially what you learn in the trailer and to be honest I wasn’t totally impressed with the idea in itself. Luckily I was surprised with The Wedding Ringer, not only was there a lot more to the movie than I thought, they also didn’t spoil all the great laughs in the trailer. I wanted to give someone a high five for that alone. Hart and Gad really play off of each other well. The script and the performances play the dynamic of cool loner guy and lonely uncool guy really well. The plot of the movie is very easy to guess what happens to all the characters. Friendships are made, backs are had, and muddy football games are played. For the most part, the film is pretty down to earth in what happens with the comedy but for some reason, once they get to the Bachelor Party things get a little too wild, a little too, I might say, Adam Sandler-esque then thankfully it goes back to a nice sense of normal. Another weird thing that stood out to me is that Olivia Thirlby is shot almost entirely in soft focus like it’s in the 60s. I don’t understand totally why they made that choice for a movie in 2015 but hey whatever man. It’s not that distracting for 99.9% of the audience. So to wrap up The Wedding Ringer is a pretty decent R-rated comedy for this time of the year. It’s also a bit different type of character for Hart instead of the annoyingly loud sidekick or narrator all-knowing funny black guy i.e. Think like a Man or About Last Night. In this terrible season of weak releasing and Award season catch up it’s something new that you can see on weekend night and laugh.